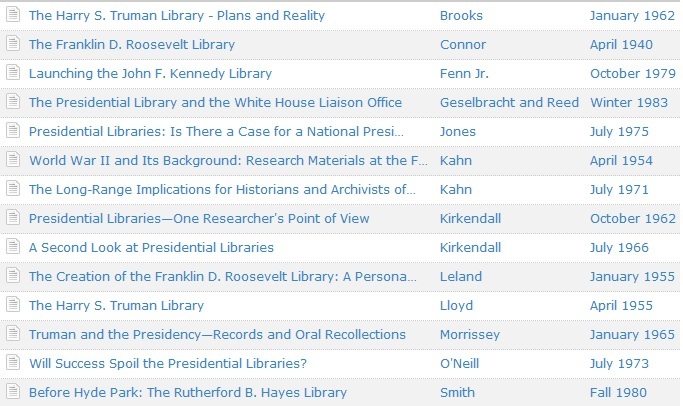 For about three months, I’ve been assembling a Zotero bibliography of articles published in The American Archivist (AA). I realize this may seem like a lot of work when there’s already a searchable index available on the publication website, but it seemed like a worthwhile use of my time for several reasons. The metadata that powers the search function on the AA site is flawed. I believe it was generated via OCR by the vendor who set up the portal. I’ve found places where characters were misread (e.g., serf instead of self) or were dropped altogether. Whatever mechanism was used to sort the tables of contents into sections is inconsistent. When I was reading and reviewing all of the annual addresses by Society of American Archivists (SAA) presidents, I realized that not all of the speeches are designated as presidential addresses. And a few things that are not, in fact, presidential addresses are labeled as such. For example, the greeting an incoming president gives during an annual meeting is occasionally (but not always) labeled as a presidential address. Spoiler alert — there hasn’t been much written in AA about correspondence! I’ve enjoyed using Zotero. It has a fairly intuitive interface, and there are useful browser plug-ins along with a standalone version of the software. Prior to this project, my greatest exposure to Zotero was through overseeing the importing and updating of the bibliography for the SAA Records Management Section. Depending on whether they piqued my research interests, I also included some items from the sections labeled Additional Matter and Shorter Features. “International Scene” began as a subsection of the Technical Notes and later became its own subsection in the table of contents; these articles were also chosen based on their applicability to my research interests. I included none of the book reviews, abstracts, council minutes, obituaries, or front matter. The reason I had to be somewhat choosy is that this was a rather labor-intensive project. The RIS file that I exported from the AA site into Zotero did not list the issue dates the way they appear in the publication itself, so I changed all of those (so that my works cited lists will be accurate). For example, AA was originally published four times a year; the April 1938 issue exported with a date of April 1, 1938. After AA switched to semiannual publication, the dates got especially problematic. I went with Spring/Summer 2011 as the publication date, although these exported with a specific date (e.g., January 1, 2011). The other labor-intensive thing I did was to track down as many published bibliographies as I could find. From 1943 to 1980, the National Archives generated an annual bibliography of publications related to archives and manuscripts and records. Usually, instead of being listed in the table of contents on the AA website, these bibliographies were buried within the Technical Notes PDF. Although I have no ability to crop the PDF, I did indicate in my Zotero entry the precise page numbers of the bibliography within the broader PDF. (Unfortunately, there are a handful of these annual bibliographies that I still couldn’t track down: 1958-59, 1963, 1965, 1967, 1968, 1970, 1974, 1979-82). If you look at my Zotero bibliography (https://www.zotero.org/cbaileymsls/items/collectionKey/8DZEFJWX), you’ll find the tags I’ve used to identify topics of interest to me. In both the browser client and the desktop client, you can click on one of my tags to find the related articles, and you can sort these entries alphabetically by title or author or chronologically by date of publication (although Zotero has a hard time understanding that the Fall/Winter issue was published after the Spring/Summer issue). This can be useful for identifying when one particular author has published multiple articles or for analyzing the frequency of publication on a particular topic. Two other improvements I tried to make were to author names. Although they didn’t export in the RIS file, I tried to add any suffixes like Jr. or III. And if an author was listed with a first initial and a middle name, the metadata only captured the initial, so I went back and added the middle name for clarity. I hope in some way this bibliography might also be of use to other folks. Perhaps it can help you find something for which you’ve been searching or challenge you to help fill a void that exists in the archival literature.